Most people have only just begun to explore the Windows 10 April Update. But for Windows Insiders, the exploration begun over six months ago, with the first Insider Preview builds for this release. We always know when Insiders have started exploring these builds. That’s when the Feedback Hub lights up with their suggestions. Not that this is the only feedback channel. We’ve got multiple community and support forums as well as telemetry that Insiders let us draw automatically from their machines. But it’s the Feedback Hub that’s often the most exciting channel of all. The Hub is where Insiders go to post, vote, debate, complain and sometimes even compliment. It can make for fascinating reading, especially if you’re a Windows engineer. In fact, it’s amazing just how often feedback in the Feedback Hub has inspired us to change plans, reprioritize, rethink and move in new directions – right in the middle of a development cycle (more often than many Insiders realize). With this article (one of many you’ll find in our Articles section) we wanted to take a quick look back at some of the highlights of this feedback and how they helped shape the latest Windows release. It’s an amazingly dialogue between engineers and Insiders that been going strong for nearly four years now, when the Windows Insider Program first began. Since then, the success of the program has not only made for a better Windows but made us a better company. Our feedback loop with Windows Insiders reminds us that the best innovation often comes from simply listening, very carefully, to the customers who use our products every day. Here are a few examples of how that listening to Windows Insiders has paid off for Windows and Windows fans. An improved My People experience. Checking off another one of our top feedback requests: you can now drag and drop contacts to rearrange them in the taskbar! Display up to 10 contacts (or show them all in the overflow). You can now use the Emoji Panel in more languages! Insiders from around the world have spoken – and you can now use the emoji in over 190 locals – 152 of which have tooltip support when you hover over each emoji. Insert a bunch of emoji at once! One Insider asked for it, over one hundred voted for it, and now this feature is part of the Emoji Panel. More discoverable folders. See those little icons in the Start Menu, left of your app list? They’re an easy way to get to the stuff you want, faster. We added Document and Pictures to the list, but several Insiders suggested that we make this list even easier to customize. So we did. More Fluent Design. It seems Insiders love Fluent Design as much as we do. So, along with multiple new dashes of Fluent Design across the Windows UI, you’ll also see that we updated the Acrylic in the tab bar and in-active tabs, based on your feedback, allowing more color to show through. Instantly mute auto-playing media on websites. This was easily one of the most upvoted feature requests from Insiders over the past six months. Microsoft Edge displays an audio icon that shows which tab is playing sound. Just click the icon to mute and unmute. Evolving full screen mode (F11): Many Insiders suggested that we update full screen mode, so you can access the address bar – without leaving full screen. Great idea! Form Fill for address fields and credit card info. Insiders were looking for an easier way to complete online forms. And we delivered! 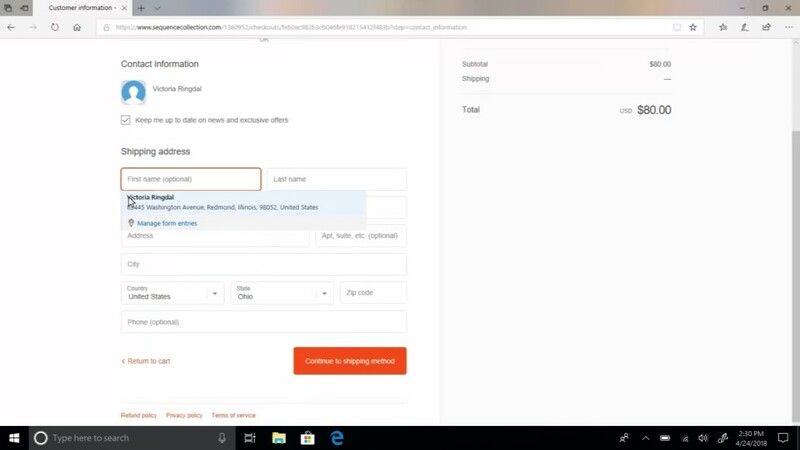 Microsoft Edge can save and automatically fill in your credit card and address information, making it easier to complete online forms. Use Extensions when InPrivate. Extensions have long been an extremely popular Insider request and we’ve added more extensions with each release. Most recently, we delivered on Insiders’ requests to load extensions even when Microsoft Edge is in an InPrivate window. Bookmark button and flyout become one. Microsoft Edge has simplified adding and managing bookmarks for EPUB and PDF books. Based on your feedback, we now allow you to add bookmarks and manage your list of bookmarks from the same location. Now in Windows 10 Pro. You spoke, and we listened. Windows Defender Application Guard was added to Windows 10 Professional in the latest feature update of Windows 10. Touch keyboard improvements. Since we redesigned the touch keyboard back with the Fall Creators Update, Insiders have provided all sorts of amazing suggestions. This included requests for: a split layout (done! ), more languages (we now support 190+), Acrylic (it’s now in all our touch keyboard layouts) and shape-writing for the wide keyboard (its in there, too). New features for Delivery Optimization. We received a lot of feedback from IT Pro Insiders telling us that they rely on Delivery Optimization to reduce the bandwidth consumption on their network. So, we added multiple policies (both Group Policies and MDM Policies) for more bandwidth control and visibility. Of course, this is just a small snapshot of the Insider feedback that came pouring in over the past six months. In fact, Windows Insider can proudly claim to have helped shape just about every aspect of Windows 10 April Update – from brilliant feature suggestions to timely alerts on bugs. As we jump into development of the next version of Windows, Insider feedback is already having a huge impact – especially on new features like Sets. If you haven’t already, we invite you to leave your own mark on Windows as a Windows Insider. For help providing the kind of feedback that makes the most impact, check out our feedback tips here. Who knows, in another six months, we might well be looking back at your feedback and how it made for a better Windows.